What Is Wonder CBD? 1.Wonder CBD is made from the strain AC/DC, which is renowned for its ultra high CBD to THC ratio. Is is NOT made from hemp oil 2.A typical dose is 1 mg per ten pounds of body weight per day, half in the am, half in the pm. So a 150 person would take 15 mg per day. 3.Each drop is approx. 1 mg, each full dropper is approx. 12 mg 4.With a ration of 25 parts CBD to 1 part THC, it is non-psycho active for most patients. 5.Many studies have linked CBD to be an effective anti-cancer treatment as well. 6.Wonder CBD contains only two ingredients. High CBD oil, and Extra Virgin organic olive oil. 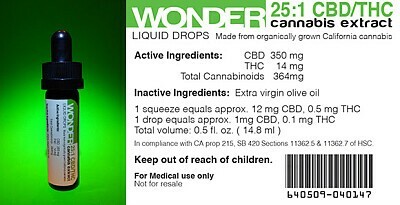 7.Wonder CBD is most effective dropped directly onto the tounge or gums. Another method is dropping onto some bread and ingesting that way. 8.As Wonder CBD is 95%+ activated, it can also be used as a topical balm, used in cooking, dropped onto food, etc.